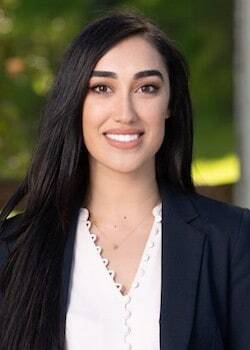 Myriam Sabry joined Mello & Pickering, LLP in January 2019. Myriam received her Bachelor’s of Science in Economics from U.C. Riverside in 2014 and completed her law school education to obtain her Juris Doctor from Pepperdine School of Law in 2017. Myriam passed the CA Bar Exam on her first attempt and has been exclusively practicing Family Law in Santa Clara County ever since. During law school, Myriam was hand chosen by the Dean of Students at Pepperdine School of Law to lead The Diversity and Inclusion Council. Myriam worked with the Pepperdine staff to create a platform where law students could feel safe to speak about the current social and political climate. Myriam worked closely with the Dean of Students at Pepperdine to put on events throughout the school year and was chosen to mentor and speak to the incoming prospective Honor students every year. During her law school education, Myriam gained extensive experience in Corporate Immigration and interned at Fragomen, the largest Corporate Immigration firm in the world. However, after shadowing an attorney who practiced high conflict family law litigation, she knew that family law was the area she was destined to practice in. Myriam is passionate about advocating for children and families during some of the hardest times of their life. Additionally, Myriam enjoys assisting clients with property division and support issues. Myriam hopes to obtain a Masters in Taxation in the near future in order to further her education on these issues. When not working, Myriam enjoys learning new languages, doing hot yoga, and taking trips back to Los Angeles to see her family and friends. In addition to English, Myriam is fluent in Farsi.